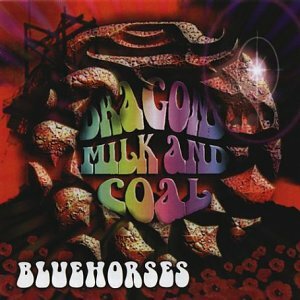 The coal industry features prominently, on the third Blue Horses album, providing a provocative escape from the blood n' thunder black leather image which has threatened to submerge them. There's still plenty here in the direct electric folk tradition of the "70s, if nothing as extreme as the Led Zeppelin references, but 'Dragons Milk...' opens with celestial harp and develops into an encouragingly balanced mixture of knees-up fiddle "n" drums showcases and strong emotive songs with thoughtful lyrics. The opening title song tells the story of singer Lizzy Prendergast's grandad, Mining Song is a moving acoustic song about the last ever shift at Abertridwr Colliery, and if any further evidence is needed of their growing maturity it's provided by the ghostly war imagery of In Flanders Fields which persists long after the CD has ended. All this, an inventive arrangement of Barbara Allen and a couple of particulary compelling hoolies of their own, Witches and Rabbits In The Headlights, and you have a highly persuasive album that should decimate some of the more negative preconceptions that may have been ignited by Cracking Leather Skin and Bone and the pagan rock descriptions it evoked. - a review by Colin Irwin of fRoots Magazine.